Laparoscopic-assisted vaginal hysterectomy (LAVH) is one of the commonly performing surgeries in our institute. Although minimally invasive, many of the patients experience moderate-to-severe pain in the early postoperative period. Postoperative pain is a major obstacle for early postoperative ambulation. It increases the risk of venous thromboembolism and respiratory complications and prolongs hospital stay. Inadequately treated postoperative pain may lead to chronic regional pain syndromes. Transverses abdominis plane (TAP) block was first described by Rafi in 2001 and was designed to anesthetize the anterior rami of T6 through L1 while they traverse the space between the transversus abdominis muscle and internal oblique muscle. Although most of the available studies on TAP block have used local anesthetic (LA) agent, few studies have reported that the adjuvant medications were added to LA to prolong the effect of TAP block. Clonidine hydrochloride is an imidazole derivative with selective α2 adrenergic agonist activity that has a variety of actions including antihypertensive effects as well as the ability to potentiate the effects of the local anesthetic. It can provide pain relief by an opioid independent mechanism. Our study was conducted to evaluate the analgesic efficacy of two different doses of clonidine as an adjunct in TAP block in patients underwent LAVH. Our study also sought to assess the hemodynamic effects, sedation, and adverse effects between two groups. After Institutional Ethics Committee approval, written informed consent was taken from all patients who were included in the study. A total of 80 patients, with the American Society of Anesthesiologists (ASA) physical Status I and II, aged between 45 and 60 years, undergoing elective LAVH under general anesthesia, were randomized into two groups. Patients with known sensitivity to LAs, allergy to study drugs, second- or third-degree heart block, renal and hepatic insufficiency, uncontrolled diabetes and hypertension, obesity (body mass index >30 kg/m), and pregnant and lactating females were excluded from the study. All patients were examined preoperatively and all routine investigations were done. Patients were explained about the concerned technique and were instructed to keep fasting for 6 h. 10 cm visual analog scale (VAS) (0, no pain and 10, worst pain imaginable) was also explained during the preoperative visit. Eighty patients were randomized using a computer-generated randomization list. Random group assigned was enclosed in a sealed envelope to ensure concealment of allocation sequence. Sealed envelope was opened by an anesthesiologist not involved in the study to prepare the drug solution according to randomization. The anesthesiologist performing the block and observing the patient was blinded to the treatment group. Data collection was done by the same anesthesiologist who was unaware of the group allocation. Patients were randomly assigned to one of the two equal groups to receive either of the following: Group LC75 – 29 ml of 0.25% levobupivacaine plus 75 μg of clonidine diluted in 1 ml of normal saline (total 30 ml) and Group LC150 – 29 ml of 0.25% levobupivacaine plus 150 μg of clonidine diluted in 1 ml of normal saline (total 30 ml). On arrival to operating room, an 18G intravenous (IV) catheter was inserted and 6 mL/kg/h crystalloid was infused. Noninvasive monitors, such as electrocardiography, noninvasive blood pressure, and oxygen saturation (SpO2), were attached, and baseline parameters such as heart rate (HR), systemic arterial pressure, peripheral SpO2, and level of sedation were noted down. After preoxygenation for 3 min, anesthesia was induced with a standard anesthetic protocol using midazolam (0.05 mg/kg), fentanyl (2 μg/kg), and propofol (2 mg/kg) followed by succinylcholine (2 mg/kg) to facilitate tracheal intubation; trachea was intubated with an appropriate-sized cuffed, endotracheal tube. Lungs were mechanically ventilated with O2-N2O (33%–66%), sevoflurane 0.8% MAC, and vecuronium bromide 0.1 mg/kg bolus followed by 1 mg intermittently for neuromuscular blockade. Tidal volume and ventilator frequency were adjusted to maintain normocapnia (EtCO240 ± 4 mmHg). Pneumoperitoneum was created by insufflations of CO2, and the operation table was tilted to about 15° Trendelenburg. Intra-abdominal pressure was not allowed to exceed 15 mmHg. At the end of the procedure, bilateral TAP block was given by a single experienced investigator. A 24G 2.5-inch needle was used to give block. The needle was blunted by rubbing it on sponge holder provided in the sterile tray. The entry point was at the midaxillary line, 2 inches cephalad to iliac crest over the triangle of Petit. The needle was advanced perpendicular to the skin in the coronal plane until the first resistance of external oblique muscle was felt, further advancement of the needle result in pop sensation as the needle entered a plane between the external and internal oblique fascial layers. A seconded resistance was felt as the needle passed through the internal oblique muscle layer. The second pop was felt on the needle reached the TAP between internal oblique and traverses abdominis muscle. After negative aspiration to exclude vascular puncture, total volume of 29 ml of 0.25% levobupivacaine plus 75 μg of clonidine diluted in 1 ml of normal saline (total 30 ml) (Group LC75) or 29 ml of 0.25% levobupivacaine plus 150 μg of clonidine diluted in 1 ml of normal saline (total 30 ml) (Group LC150), the total volume was divided equally and administered bilaterally. At the end of the operation, neuromuscular blockade was antagonized with injection of neostigmine (0.05 mg/kg) and glycopyrrolate (0.008 mg/kg) intravenously, and the patient was extubated when respiration was deemed sufficient and they were able to obey commands. The patients were transferred to recovery room. In the postanesthesia care unit, they were monitored for any evidence of complications or adverse events. Postoperative pain was evaluated by visual analog score (VAS) of 0–10 cm (0 = no pain and 10 = worst pain) for pain scoring at 2, 4, 6, 12, and 24 h. Patients were evaluated for side effects such as bradycardia, hypotension, dry mouth, and sedation. Sedation score was assessed according to the modified Ramsay sedation scale from 1 to 6 as follows: 1 = anxious, agitated, and restless; 2 = cooperative, oriented, and tranquil; 3 = responds to commands only; 4 = brisk response to light glabellar tap or loud noise; 5 = sluggish response to light glabellar tap or loud noise; and 6 = no response. Bradycardia was defined as a decrease in HR by 20% from the baseline value or an absolute HR <50 beats per min which was managed by 0.5 mg IV bolus of atropine. Hypotension was defined as fall in blood pressure by 20% from the baseline or an absolute mean arterial pressure (MAP) <60 mmHg which was managed by IV crystalloids (200 ml of ringer lactate/normal saline) or increments of mephentermine 3 mg IV. Duration of analgesia was calculated from the time of giving block at the end of surgery to the time when VAS was equal to or more than 3 (moderate pain). Rescue analgesia was provided with injection diclofenac sodium 75 mg intramuscularly when VAS ≥3 cm. The number of diclofenac injections given to each patient during the first 24 h of the postoperative period was recorded. Sample size calculation was done based on a pilot study of ten patients (five in each group). The duration of analgesia in pilot study in two groups was 370.9 ± 146.2 min and 556.2 ± 181.4 min, respectively. To detect an observed difference of 3 h in the duration of analgesia between the groups, with a Type 1 error of 5% and a power of 80%, the minimum sample size required was 37 in each group. We included forty patients in each group for better validation of results. Data were checked, entered, and analyzed using SPSS version 19 for Windows (IBM Corp., Armonk, NY, USA). Quantitative data were represented as mean ± standard deviation, and for qualitative data, number and percentages were used. Students' t-test was used as test of significance to find an association for quantitative data. Chi-square test was used as test of significance to find the association for qualitative data. P < 0.05 was considered statistically significant. A total number of 80 patients, undergoing elective LAVH surgery under general anesthesia, were randomly assigned to one of the two equal groups [Figure 1]. The demographic characteristics such as age, body mass index, and ASA grade were comparable in both groups [P > 0.05, [Table 1]. The mean duration of surgery between the two study groups was comparable [Table 1], P > 0.05]. There was no difference in baseline vital signs (HR, MAP, and SpO2) in both groups. 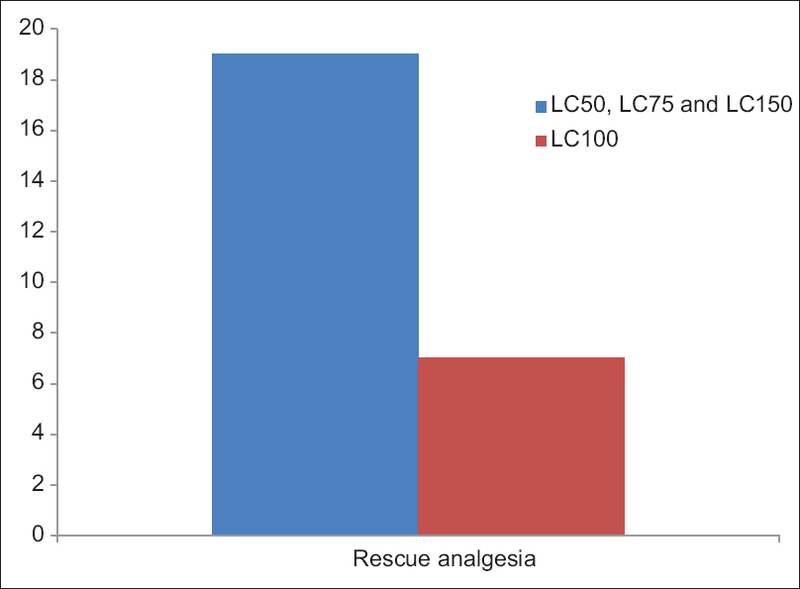 The duration of analgesia was significantly prolonged in Group LC150 (609.18 ± 6.59 min) when compared with Group LC75 (410.52 ± 7.18 min) (P = 0.001) [Table 2]. About 19/40 patients (47.5%) in Group LC75 required diclofenac sodium injection as rescue analgesia, whereas 7 of 40 patients (17.5%) in Group LC150 required rescue analgesia in the first 24 h of postoperative period [P = 0.037; [Figure 2]. Patients received higher concentration of clonidine had significantly lower pain score even after 6 h, and there was statistically significant difference in pain score at 12 and 24 h [Table 3]. The incidence of adverse effects, namely sedation and bradycardia, was significantly higher in Group LC150 compared with Group LC75 [Table 4]. However, the incidence of hypotension was statistically not significant between the groups (P = 0.056). Bradycardia required only one dose of atropine with no further recurrence in all cases. Hypotension was treated with 200 ml bolus of crystalloids (ringer lactate/normal saline) and mephentermine 3 mg IV with no further decrement. Significantly more number of patients in Group LC100 had higher sedation score (>3) than those in Group LC50. The results of this prospective, randomized, double-blinded study demonstrate that adding 150 μg clonidine to 0.25% levobupivacaine prolongs the duration of postoperative analgesia more than 75 μg clonidine in TAP block. The incidence of sedation and bradycardia was observed in more number of patients in LC150 group, compared to LC75 group. The higher dose of clonidine causes more sedation, which although ensures patient comfort in most cases, but might be harmful in certain patients. TAP block is a regional anesthesia technique commonly using for postoperative analgesia following lower abdominal surgeries. It reduces rescue analgesic consumption, early ambulation, and thereby early discharge. Over the time, various LA agents from lignocaine to bupivacaine, levobupivacaine, and ropivacaine in different concentration were used for TAP block. The role of clonidine as an adjuvant to LA in peripheral nerve blocks has been extensively studied. Dose range of 30–300 μg has been used in various studies with up to 150 μg doses being associated with minimal side effects. However, some studies have shown that clonidine even at such high doses can cause significant hemodynamic compromise which challenges its use in peripheral nerve blocks in outpatients. Besides, there is no study suggestive of any appropriate dose of clonidine according. In a few clinical studies, a lower dose of clonidine (0.1–0.5 μg/kg) was used as adjuvants for peripheral nerve block. A recent meta-analysis of randomized trials has demonstrated that the addition of clonidine to LAs significantly prolongs the duration of analgesia when used for peripheral nerve and plexus blocks. The reason for the prolonged effect seen with clonidine is not clearly understood because α2 receptors are not present on the axon of the peripheral nerve. Laboratory investigations have suggested that clonidine exerts an effect directly on the nerve fiber, as a result of a complex interaction between clonidine and axonal inotropic, metabolic, or structure proteins (receptors). Another hypothesis that may explain prolonged analgesia with clonidine is the systemic absorption of the drug from TAP. This systemic absorption was the reason for sedation in 11 patients in Group LC75 and 23 patients in Group LC150. Although the difference between the two groups was statistically significant, clinically, it was not relevant and did not in any way pose a clinical problem. Although intravenous clonidine causes sedation, association is less when used in peripheral block; McCartney et al. reviewed 27 studies and reported that only five studies showed increased sedation where clonidine used as additive, among patients who sedated only one required oxygenation who received 300 μg clonidine, and no patients required ventilator support. In similar to our results, Dhupia et al. reported that increase in the dose of clonidine would increase the effect of TAP block. Adverse effect of drug was also studied. In their study, Group A received bupivacaine 0.25% 38cc + clonidine 150 μg and Group B received bupivacaine 0.25% 38cc + clonidine 300 μg. It was a bilateral block. There was significant difference in VAS score at 2, 4, and 6 h, but at 12 and 24 h, difference was insignificant. They concluded that clonidine shows dose-dependent analgesia and adverse effect in TAP block for postoperative analgesia. Higher doses of clonidine may be used as an adjunct in TAP block. Clonidine produces dose-dependent analgesia on parental administration. Buttner et al. studied effect of mepivacaine plus 120 μg and 250 μg clonidine with mepivacaine alone in axillary nerve block failed to found clear cut relationship between clonidine dose and duration of analgesia or side effect, but in our study, duration of analgesia was significantly (P = 0.0001) higher in Group LC100 [Table 2]. Elliots et al. failed to find any significant difference in postoperative analgesic consumption after intramuscular or wound infiltration of clonidine (150 μg) in inguinal herniorrhaphy under inguinal hernia block with 29 ml 0.25% bupivacaine. In our study, postoperative hemodynamic parameters were also studied. The systolic blood pressure, diastolic blood pressure, and SpO2 were comparable postoperatively (P < 0.05). No patient in Group LC75 developed bradycardia [Table 4] while two patients in Group LC150 showed bradycardia and responded to IV atropine, but the incidence was statistically significant (P = 0.009). In contrary to our study, Chakraborty et al. found that there was no statistically significant difference observed in HR, blood pressure, and SpO2 between the two groups at any time point. One limitation of this study is unavailability of real-time ultrasonography in our institute, and lack of proper assessment of success rate of TAP block procedure as it was performed following the induction of general anesthesia, but we depend on the skills of the investigators. A second limitation is the inability to assess clonidine plasma concentration among study patients to determine whether its action was related to systemic absorption or pure local effect. 150 μg clonidine added to levobupivacaine in TAP block produces a longer duration of analgesia than 75 μg. Higher dose of clonidine has more sedative potential that can be harnessed to allay patient anxiety. 150 μg clonidine produces higher incidence of bradycardia, which requires close monitoring. Ganai S, Lee KF, Merrill A, Lee MH, Bellantonio S, Brennan M, et al. Adverse outcomes of geriatric patients undergoing abdominal surgery who are at high risk for delirium. Arch Surg 2007;142:1072-8. Shin HJ, Kim ST, Yim KH, Lee HS, Sim JH, Shin YD, et al. Preemptive analgesic efficacy of ultrasound-guided transversus abdominis plane block in patients undergoing gynecologic surgery via a transverse lower abdominal skin incision. Korean J Anesthesiol 2011;61:413-8. John R, Ranjan RV, Ramachandran TR, George SK. Analgesic efficacy of transverse abdominal plane block after elective cesarean delivery – Bupivacaine with fentanyl versus bupivacaine alone: A Randomized, double-blind controlled clinical trial. Anesth Essays Res 2017;11:181-4. Kohli S, Kaur M, Sahoo S, Vajifdar H, Kohli P. Brachial plexus block: Comparison of two different doses of clonidine added to bupivacaine. J Anaesthesiol Clin Pharmacol 2013;29:491-5. Stoelting RK, Hiller SC. Pharmacology and Physiology in Anaesthetic Practice. 4th ed. Philadelphia: Lippincott Williams & Wilkins; 2006. Riessen R, Pech R, Tränkle P, Blumenstock G, Haap M. Comparison of the RAMSAY score and the Richmond Agitation Sedation Score for the measurement of sedation depth. Crit Care 2012;16:326-8. Kadam VR, Howell S, Kadam V. Evaluation of postoperative pain scores following ultrasound guided transversus abdominis plane block versus local infiltration following day surgery laparoscopic cholecystectomy-retrospective study. J Anaesthesiol Clin Pharmacol 2016;32:80-3. Casati A, Magistris L, Fanelli G, Beccaria P, Cappelleri G, Aldegheri G, et al. Small-dose clonidine prolongs postoperative analgesia after sciatic-femoral nerve block with 0.75% ropivacaine for foot surgery. Anesth Analg 2000;91:388-92. Singh R, Kumar N, Jain A, Joy S. Addition of clonidine to bupivacaine in transversus abdominis plane block prolongs postoperative analgesia after cesarean section. J Anaesthesiol Clin Pharmacol 2016;32:501-4. Marinangeli F, Ciccozzi A, Donatelli F, Di Pietro A, Iovinelli G, Rawal N, et al. Clonidine for treatment of postoperative pain: A dose-finding study. Eur J Pain 2002;6:35-42. Eisenach JC, De Kock M, Klimscha W. Alpha (2)-adrenergic agonists for regional anesthesia. A clinical review of clonidine (1984-1995). Anesthesiology 1996;85:655-74. 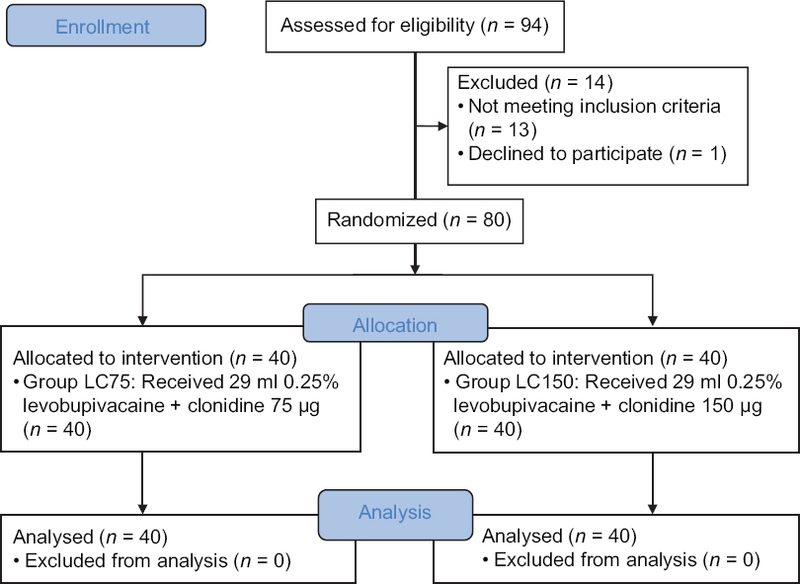 Elia N, Culebras X, Mazza C, Schiffer E, Tramèr MR. Clonidine as an adjuvant to intrathecal local anesthetics for surgery: Systematic review of randomized trials. Reg Anesth Pain Med 2008;33:159-67. McCartney CJ, Duggan E, Apatu E. Should we add clonidine to local anesthetic for peripheral nerve blockade? A qualitative systematic review of the literature. Reg Anesth Pain Med 2007;32:330-8. Dhupia R, Jain S, Sahani IS, Modi V, Romday R, Kothari A, et al. Effect of adding various doses of clonidine as an adjunct in transversus abdominis plane block in unilateral inguinal hernioplasty. Int Surg J 2017;4:4039-42. Büttner J, Ott B, Klose R. The effect of adding clonidine to mepivacaine. Axillary brachial plexus blockade. Anaesthesist 1992;41:548-54.